Steven Schultheis relates that his Grandfather, C. M. Schultheis, was an automotive engineer with Studebaker in the 1940's and 1950's. 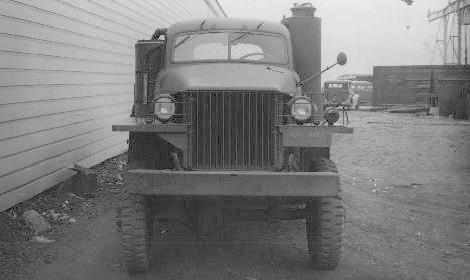 One of his projects was a coal powered 6X6 truck for the U.S. Army. 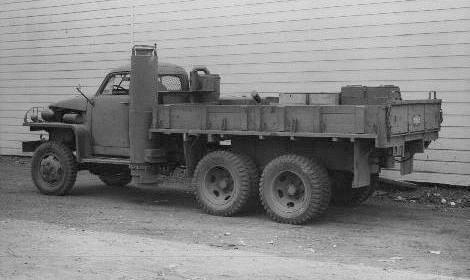 The truck was used along the Alaskan Highway in the mid to late 1940's. These pictures were taken in South Bend in 1945. Steven indicates that the truck runs on coal, but he does not know if it has a steam engine, or if it uses a gasification process. Does anyone have additional information about this unusual truck? An e-mail from Bill Skizik SKIZIK777@aol.com indicates that the truck was not steam powered. Rather, it used coal gas as fuel for the engine. Bituminus coal was roasted in a chamber, and then the gasses were extracted into the engine. Thanks to Steven and Bill for providing information and insight regarding this unique Studebaker vehicle.